For years Shiv Sena supremo Bal Thackeray has enthralled his supporters with his fiery speeches from Shivaji Park at Dadar, central Mumbai. On Sunday, thousands of mourners will pay their last respect to him at the same ground. Thackeray's body will be taken out in a massive procession from his Bandra east residence Matoshree to the party headquarters Sena Bhavan in Dadar at 7.30 am. From there, it is expected to reach at Shivaji Park by 9 am where thousands of mourners will get the opportunity for a last 'darshan' of their firebrand leader. 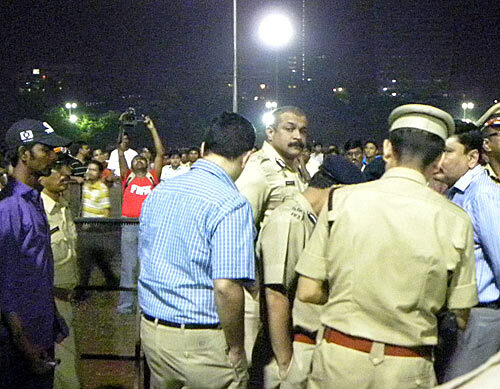 He will be cremated at Shivaji Park, a ground so beloved to him. 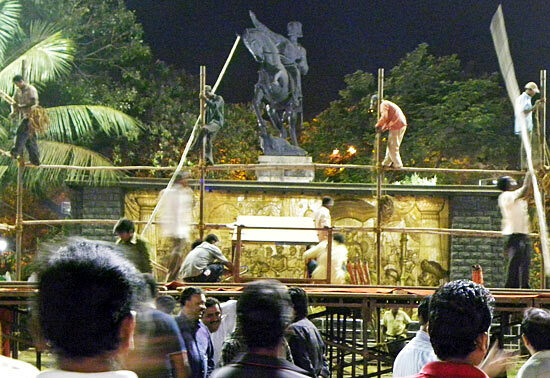 Shiv Sainiks are currently busy putting up a giant stage at the ground under the watchful eyes of the Mumbai police. Also present is Maharashtra Navnirmal Sena chief Raj Thackeray. The ceremony will also see participation of a large number of dignitaries, including senior BJP leader LK Advani. Mumbai police officials, including Joint Commissioner of Police (crime) Himanshu Roy (centre), planning the security setup for Sunday, when thousands of Shiv Sainiks are expected to converge on Shivaji Park. 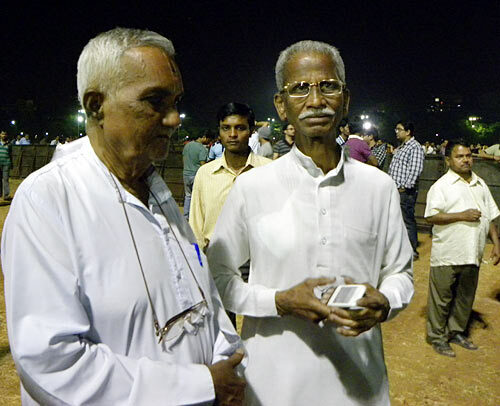 Former Mumbai mayor and Shiv Sena leader Mahadev Deyole (right) was at Shivaji Park during the preparations on Saturday. 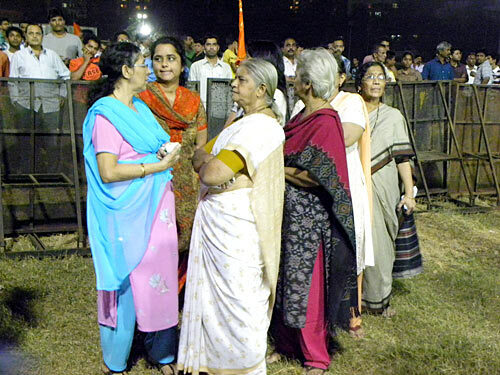 Women Shiv Sainiks at Shivaji Park on Saturday night. Many a time in the recent past the MNS, led by Bal Thackeray's estranged nephew Raj, has been at political loggerheads with the Shiv Sena. But the demise of the patriarch has in a way brought down the walls. 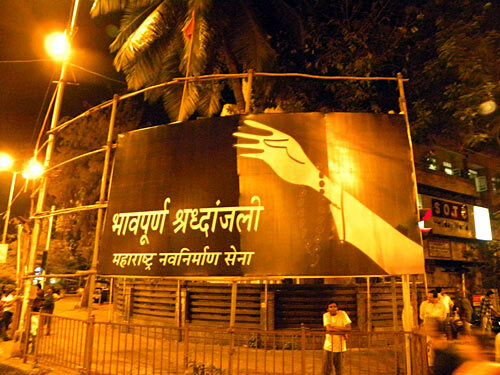 A giant MNS hoarding came up in quick time to pay tribute to Bal Thackeray right opposite the Shiv Sena headquarters in Dadar. 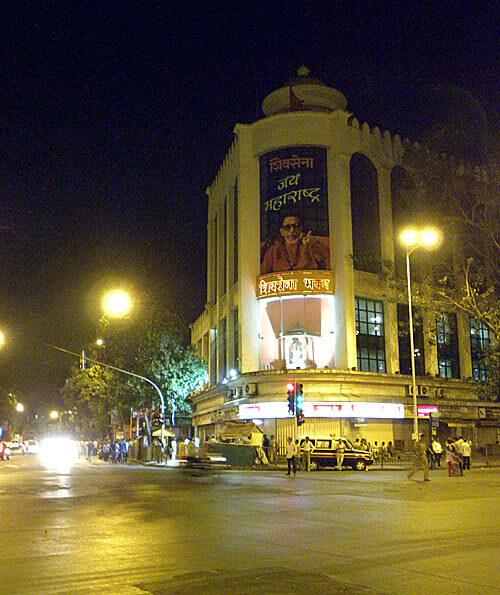 The Shiv Sena headquarters in Dadar, Sena Bhavan, wears a deserted look on Saturday night. 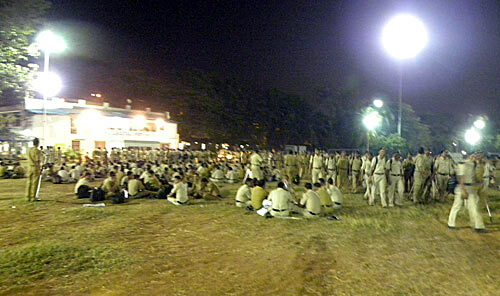 A large number of Mumbai police personnel have been stationed at Shivaji Park, to prepare for Sunday when passions are bound to run high. 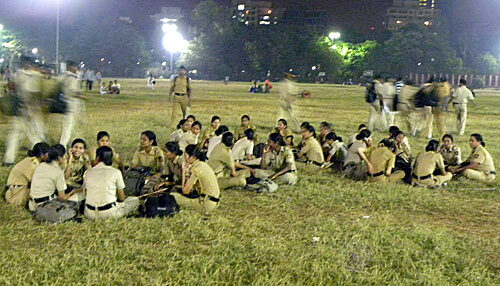 Women constables of the Mumbai police will also be deployed at Shivaji Park in large numbers.